Since the German Marshall Fund of the United States unveiled its “Alliance For Securing Democracy (AFSD),” I’ve resisted commenting, simply because the lobby group’s “Hamilton 68 dashboard” is too preposterous to merit serious analysis. To achieve these goals they’ve hired the usual roll call of reliably anti-Russia blowhards. Including Estonian-American politician Ilves Toomas and rent-a-quote talking head Michael McFaul, the ‘Mother Theresa of the Russia beat.’ Those two are joined by neoconservative windbag William Kristol and ex-CIA chief Michael Morell. The dashboard itself is helmed by a chap named J.M. Berger, who was apparently an expert on ISIS and the Middle East, before discovering the Russia-bashing gravy train this summer. This week, he’s taken to the pages of Politico to explain his plaything. What follows is best described as an inept and ignorant form of thrift-store McCarthyism. Berger tells us how his dashboard displays “the near-real-time output of Russian Influence Operations on Twitter.” Something he calls RIOT, for short. And he cites things like RT’s coverage of Vladimir Putin’s recent pike fishing trip, a jaunt also prominently featured in The New York Times, The Daily Mail and The Sun, which incidentally described Putin as a “beefcake.” Meaning, either Paul Dacre and Rupert Murdoch are Russian agents, or this contention is just farcical. The lobbyist also frets over this network’s widely-shared report on Oliver Stone’s Facebook post “condemning US sanctions against Russia and claiming US intelligence agencies are engaged in a ‘false flag’ war against Russia.” Which exposes a total lack of comprehension of how news works. Because Stone is one of Hollywood’s most famous figures and his name attached to a perspective like this was bound to attract plenty of attention, regardless of the messenger. It’s also worth pointing out (for the really obtuse) that RT obviously doesn’t control Stone’s Facebook and was merely bringing to a wider audience the American writer and director’s personal beliefs. The examples become ever stranger. Berger bemoans “conspiracy theories seeking to discredit Bana al-Abed, a young girl in Syria who tweeted about the civil war.” But it doesn’t seem unreasonable to suggest the then seven-year-old was manipulated to serve a propaganda effort. Especially after a press interview revealed how the child couldn’t understand even rudimentary English, despite issuing hundreds of perfectly crafted tweets in the language. Our hero descends further into hogwash when observing how “the most retweeted Russia Today stories recorded by the dashboard involved scaremongering videos appearing to show refugees swarming into Spain.” But, two weeks ago, a boatful of migrants did land on a Spanish tourist beach, near Cadiz, and quickly scattered to evade police detection. And numerous outlets, including The New York Times, The Guardian and the BBC prominently reported the story. But apparently, it’s only an issue when RT gives it coverage. But the garrulous quack isn’t finished, asserting how RT “treads relatively carefully in their flirtation with the far right, and they devote a significant amount of space to the far left as well.” Hardly news, given how the channel openly admits offering a platform for alternative voices, regardless of their political compass. Incidentally, a mirror image of what America’s state broadcaster’s RFE/RL and VOA do in Russia where they laboriously detail the travails of nationalist politicians like Alexei Navalny and their leftist counterparts, such as Sergei Udaltsov. This is what alternative media does in every market, but it seems to be only unusual when “the Russians” are involved. “it is important to note here again that we are not asserting Russia is responsible for creating or shaping this content,” he writes. Which suggests he fully understands how his project is geared to smear anybody who opposes US policy as working for Moscow’s interests. But, not content with mulching around the bottom of the barrel, he reaches into the depths when he states “while the alt-right has a very real base of support in the United States, it also enjoys deep and undisputed ties to Russia, many of which can be found offline in the real world.” Amazingly, the link he uses to justify his contention is a Daily Beast article on how American white supremacist Richard Spencer was married to an ethnic Russian. The lady involved has no profile in Russia, doesn’t live in the country and is a follower of a fringe philosopher called Alexander Dugin. Who is so far outside the Russian mainstream that he can’t even hold down a job in Moscow. The fact Berger has to descend to such irrelevant tittle-tattle to score a few points tells us all we need to know about the moral bankruptcy of the Alliance For Securing Democracy. This is pathetic, miserable and feeble stuff and the German Marshall Fund of the United States should be ashamed of themselves for financing this sort of muck. Bryan MacDonald is an Irish journalist, who is based in Russia. 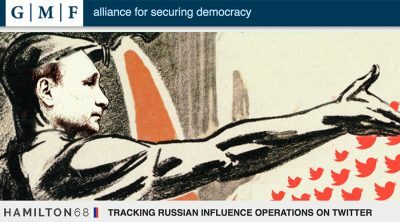 Featured image is from dashboard.securingdemocracy.org.